Lots of orange, basic black and a host of bewitching decorations give fright night a spellbinding spin. 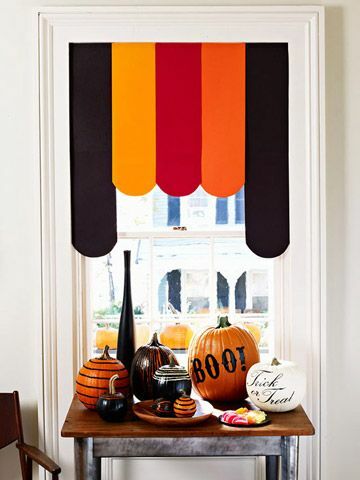 Dress up a window for the witching hour with a colorful striped awning and a few wickedly wonderful pumpkins. Here's how: Cut enough sheets of colored art paper into strips to fit the width of your window (ours are 7 1/2 inches wide). Create a scalloped edge on the bottom of each strip by tracing around a plate. Lay out the strips in your desired color sequence, making the two outer strips longer than the rest, and tape them together along the seams. Length depends on size of window. Fold the top edge under about an inch, and tape that edge under the window molding. —Create a numbers and words template (click on link below to download template) by printing on rub-on paper, using "photo" as the printer setting, and follow the manufacturer's directions for applying the adhesive sheet. Cut out around the words/numbers and apply the rub-ons to the pumpkins. 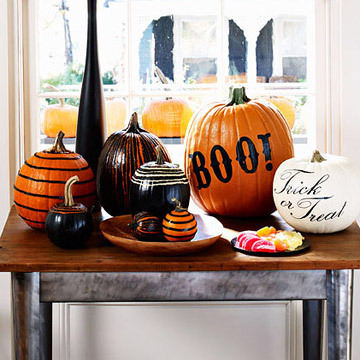 —To get a striated effect, spray pumpkins with glossy black paint. When completely dry, scratch vertical or horizontal lines into paint with the tip of a key. 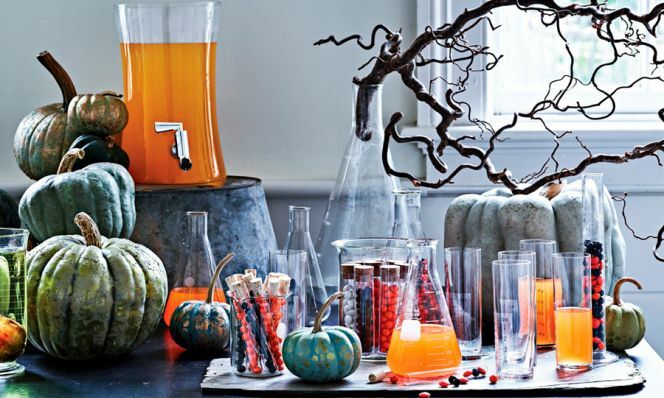 —For glitter stripes, glue sequin strips on pumpkins using Magna-Tac. 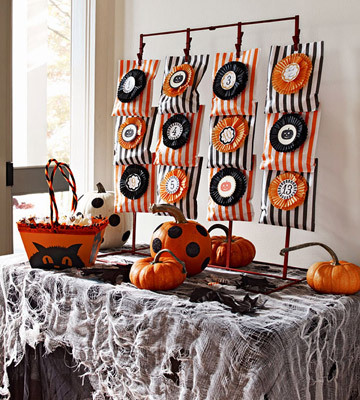 Conjure up a display of boldly patterned treat bags and polka-dot pumpkins. Here's how: For the striped treat bags, start by flattening out a cupcake liner. Scrunch up the middle of a second liner to form a ruffled shape. (The top liner should be cut smaller than the bottom liner.) If desired, make a decorative edge with scalloped-blade scissors. Adhere the liners together with quick-setting gel glue, then glue onto a treat bag. Download and print the medallion clip art (click on link below) on brochure paper and cut out using a craft punch. Glue the medallions onto the center of the cupcake liners. For cobweb tablecloth use torn cheesecloth. 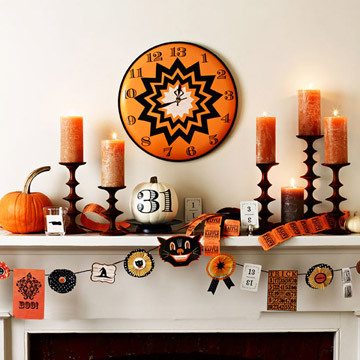 Trick out the mantel with graphic pumpkins, a magical clock and a garland festooned with an eclectic mix of odds and ends. Here's how: Prime and paint the reverse side of a 16-inch pizza pan and set it aside to dry thoroughly. Adhere pieces of black masking tape along the rimmed edge to create a border (optional). Print out the starburst templates (click on link below) and cut them out. Trace around the templates onto the reverse side of colored Con-Tact or scrapbook paper and cut them out. Working from the center outward, adhere the starbursts to the pizza pan. (If using scrapbook paper, adhere the paper with a quick-setting craft glue.) Print clock numbers on rub-on paper and follow manufacturer's directions for application, or buy self-adhesive number stickers. For clock hands, place a brad fastener through the hole in the two clock hands and fasten them together. Adjust so hands almost point to 13. Glue the hands to the middle starburst. Tip: If you want a clock that really works, you can buy the materials at a craft or hardware store. Just drill a hole in the center of the pan and follow manufacturer's instructions for putting together the clock kit. 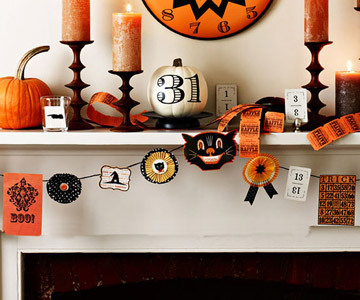 Here's how: Collect an assortment of Halloween ephemera. We used downloadable images from etsy.com and ticket stubs, old playing cards, vintage Halloween graphics and postcards. Most items can be taped to the twine. To craft rosettes, glue two cupcake liners together and add a sticker of your choice or a button in the middle. Glue a folded length of ribbon to the back if desired. 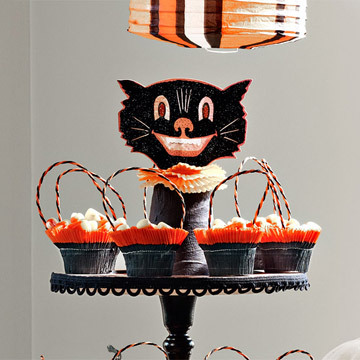 Black cats, lucky numbers and delicious sweets set a festive scene. Here's how: For display stand, paint a wooden candlestick and two wooden plates, one slightly larger than the other, with acrylic craft paint and set aside to dry. Decoupage decorative scrapbook paper (we used polka dots) onto the top of the plates and let dry. Finish tops with two light coats of Mod Podge. Remove the inner ring from an embroidery hoop and apply glue along the rim. Adhere it to the underside of the larger plate to create an elevated base. Let dry. Using a heavy-duty adhesive, glue the top and bottom of the wooden candlestick to the plates as shown. Let the stand dry thoroughly. Attach fabric trim to the edge of the plates with quick-setting gel adhesive. Here's how: Print two copies of the vintage cat image (etsy.com/shop/harmonicagoldfish) in desired size; cut them out. Use craft glue and a fine-tipped applicator to add glue to all black parts of the image; sprinkle with glitter. When dry, shake off excess. Glue a toothpick vertically to the back of one of the cat images, then glue the second cat image to the first (so there are faces on both sides). Flatten four cupcake liners and poke the toothpick through the center to form a ruffled collar. Poke the toothpick through the bottom of a paper cup. Leave the paper cup as is or, for a matte finish, stretch a piece of crepe paper streamer around the cup, securing the ends to the cup with glue. 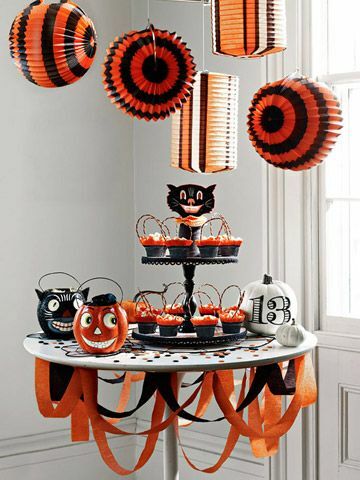 Place entire topper on display stand. 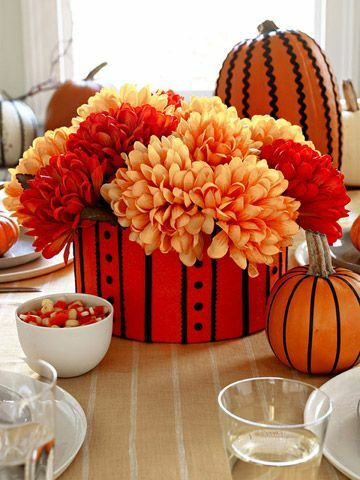 A box full of mums and pumpkins embellished with rickrack makes a spellbinding centerpiece. Here's how: Trace the outline of the top and bottom of a papier-mâché hatbox onto a width of felt. Unwrap the felt and cut about one inch above and below the traced lines so you can wrap the felt over the box's edges. Apply paste or glue (we used Yes! Paste) to the hatbox and adhere the felt strip to the box, smoothing it with your hands. Fold the felt over the inside edge of the box and glue it with gel adhesive. Fold the other end of the felt under the box and glue that as well. Cut or punch out details from a piece of black felt—you can use scalloped-edge shears to cut stripes or a hole punch to make small dots, for example. Adhere the details to the box using quick-setting gel glue. 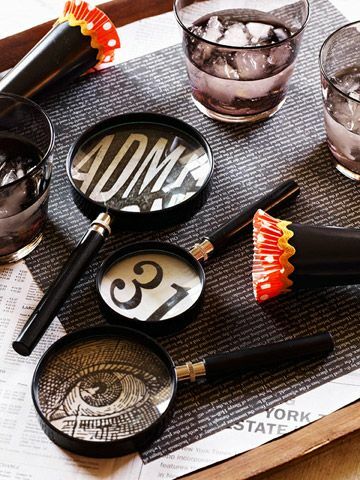 Make an eye-popping still life of magnifying glasses featuring eerie vintage images. Here's how: Download clip art circles of various sizes (click on link below), and print on white card stock. Cut out the circles, apply quick-setting gel glue to edges, and adhere the images to the rims of magnifying glasses.